Classical Revival. Tall 2-story, 4-bay brick house with asymmetrical plan and appearance. Hipped roof has patterned slate shingles. 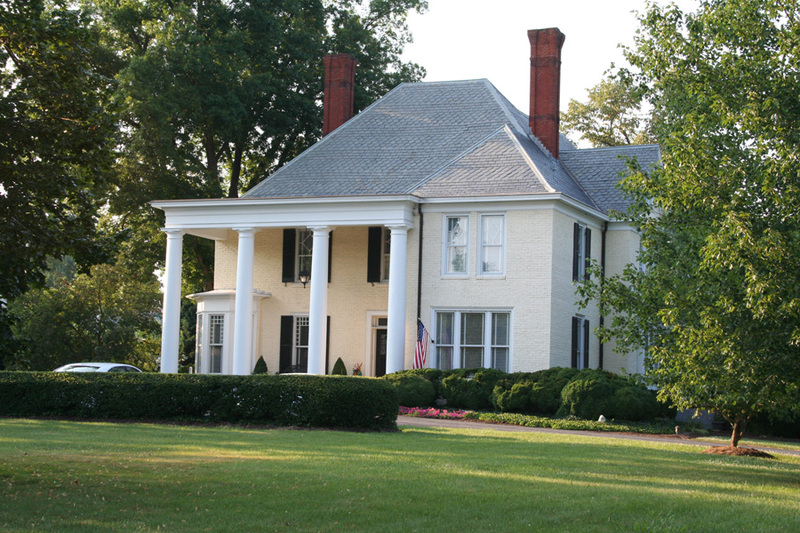 Porch on west 3 bays has 2-story Tuscan columns with classical entablature. Windows have 1/1, 2/2 and multi-light sash. 2-story porch on east is enclosed on second story. Gable-roofed wing is on the rear. Extensive alterations changes this from a Queen Anne-style house to a Classical Revival style. This home, in its 1894 configuration, was the first Rivermont Avenue home of George and Mary Jones (see Jones Memorial Library at 434). They then built and moved to 456 Rivermont. The extensive alterations to the 1894 Queen Ann included the removal of a tower, replacing the porch with the current 2-story portico, and facing the house with red brick. More recently, this brick has been painted yellow.